I’m mostly a vegan (but eat the CSA eggs as they come from happy hens), and my boyfriend Greg usually eats vegan food when we’re at home (he describes himself as a part-time vegan). 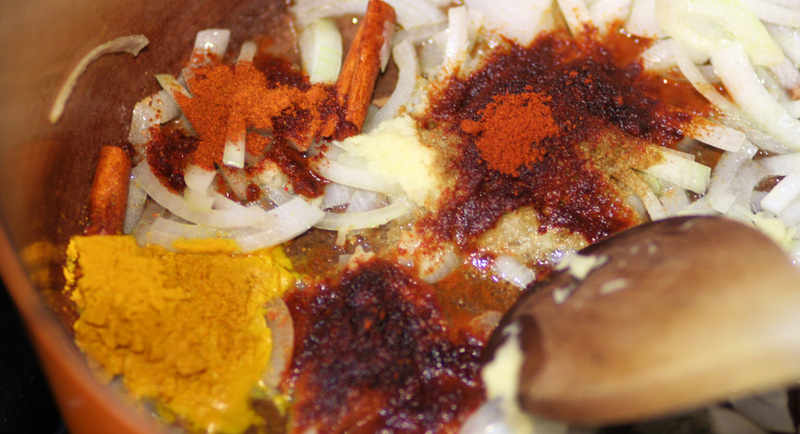 Greg loves spicy food, so over the years we’ve gravitated towards Indian cooking. Greg used some of last week’s jalapenos to test out a surprisingly simple and tasty recipe: Chilli-Laced Split Pea Griddle Cakes. Clean the split peas and lentils, put them in a bowl and rinse. Soak them, along with the rice, in water for 8 hours or overnight. Drain everything. In a food processor, grind the rice for 2 minutes until finely ground. Add the drained split peas and lentils, water, chili, asafetida, red pepper, and salt and process to a slightly coarse puree, turning off the machine to scrape down the sides of the container. The batter should be thick like muffin batter, but not dry. If it is too dry, add some water. Heat a frying pan over medium-high heat. Brush the surface very lightly with oil. Add about 1/2 cup batter in the center of the griddle. Spread the batter into a neat 6-inch round, using your fingers, a spoon, or a spatula. 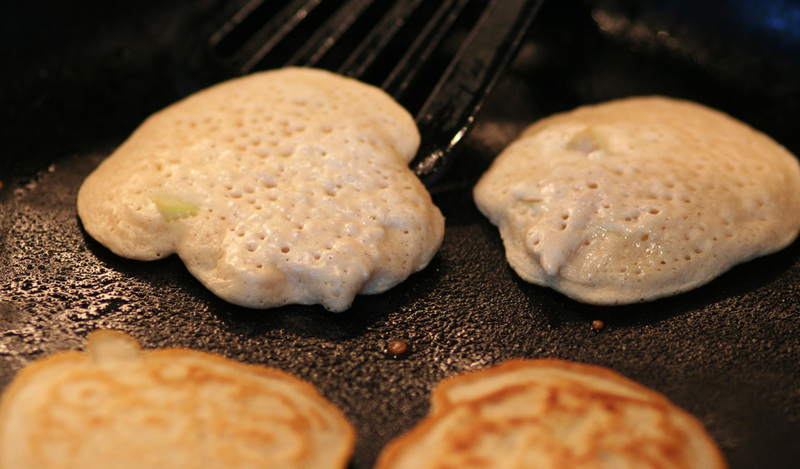 Let the griddle cake cook for 3-4 minutes, until the underside is nicely browned and crisp. Flip the cake and cook the other side for 1 or 2 minutes, or until both sides are golden brown and the griddle cake looks crisply fried. Combine ginger, cumin, paprika, turmeric, cayenne in cup. Put oil in pan over medium-high heat. Add cinnamon stick, then onion. Fry 3 minutes, until medium brown. Add cup of spices, then tomatoes. 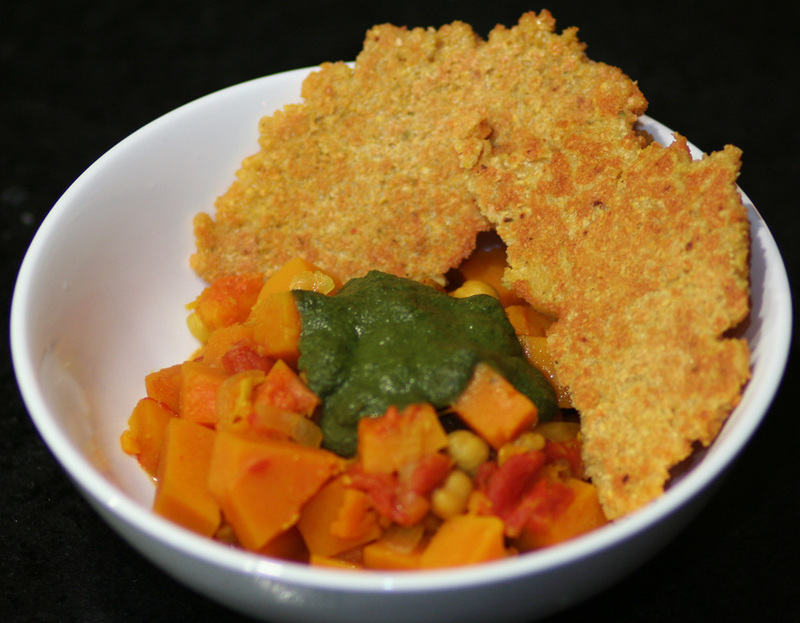 Cook 3 to 4 minutes, then add chickpeas, pumpkin or squash, raisins, stock, salt. Bring to a simmer. Cover, turn heat down, cook 15 minutes, until squash is tender. Add cilantro just before serving. We topped the curry with Cilantro and Mint Chutney made with last week’s herbs and jalapeno. Later in the week we used Madhur Jaffrey’s recipe (from the same book) for South Indian Cabbage, but replaced the cabbage with the collard greens. The collard greens took longer to cook, but turned out well. The South Indian Cabbage recipe was previously posted on the blog here! I cut up and boiled one of the beets for Beet, Tofu Ricotta (or regular ricotta) and Horseradish sandwiches, which I love. 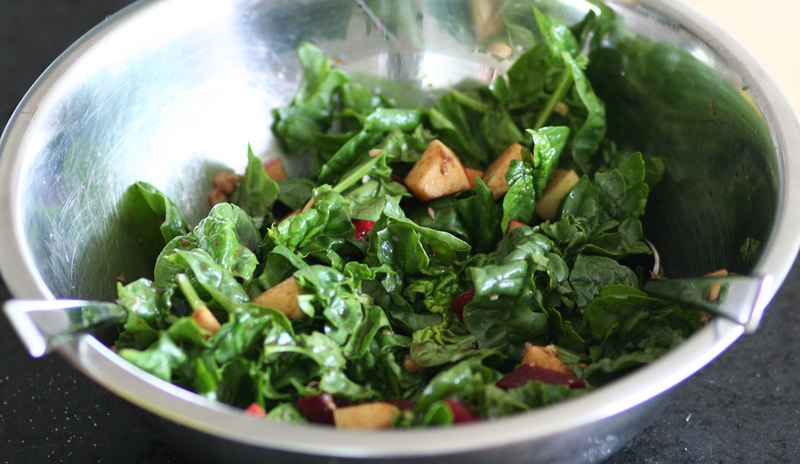 The other beet went into an Apple, Beet and Walnut Salad, using up the spinach from last week. The cherry tomatoes and one of the red peppers got turned into bruschetta. Just dice the vegetables and some red onion, grate a clove of garlic, chop up some basil, and toss everything in balsamic vinaigrette. 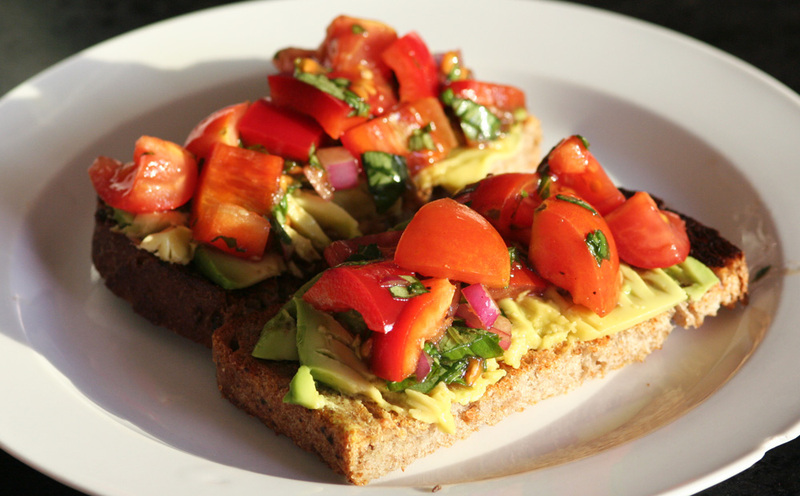 Serve on toast. 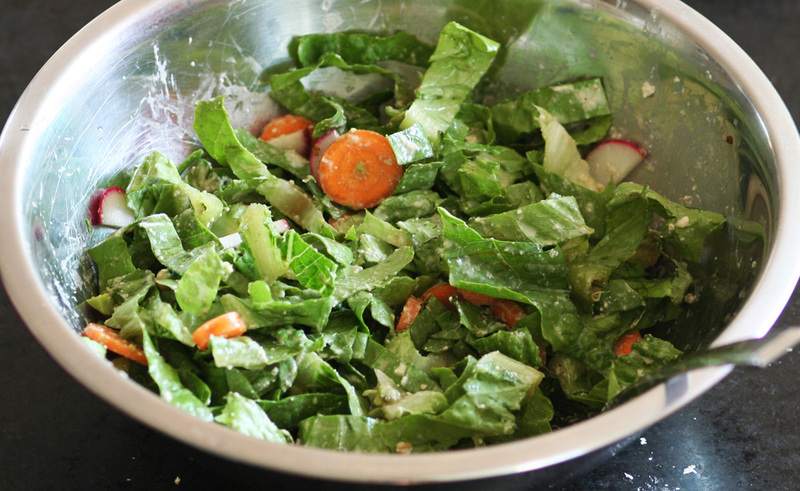 We used the lettuce, carrots and radishes for salads. We ate the eggs for breakfast, fried or as omlettes. 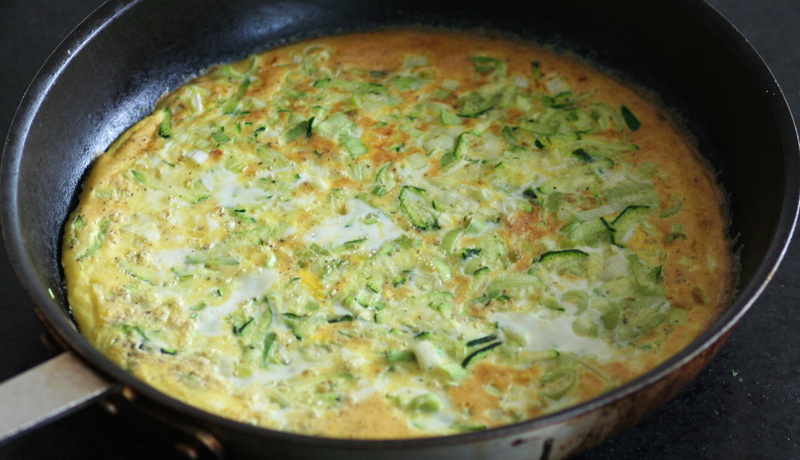 One day we made a frittata with the leeks and grated zucchini. Like everyone else with both Orchard and Berry shares, we’ve been overwhelmed with apples. This week I left the bucket of apples on the counter by our front door. Everyone who came over was offered an apple (or two). And they all commented on how delicious they were. 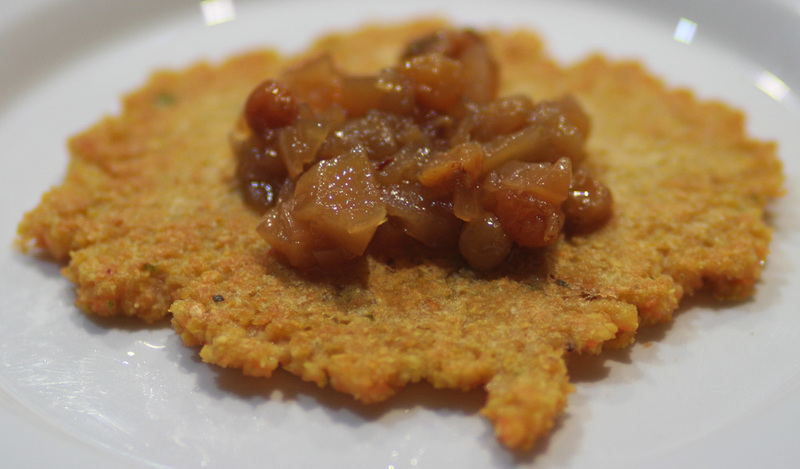 Last week I made Apple Ginger Chutney using this recipe. It turned out well, and we ate it on the Griddle Cakes Greg made. We also made Apple Pancakes using this really great recipe. I turned the remaining apples, along with the pears, into a Fruit Crumble. Pies take time and energy, but crumbles are so easy to throw together, and just as satisfying. Core and slice 6 cups of apples and/or pears. If you want, you can peel them, but I usually don’t bother. Combine them with one cup of berries, fresh or frozen, 2 tablespoons of brown sugar and 2 tablespoons of flour. Place in a pie dish. For the crumble topping, combine 1/4 cup of flour, 1/2 cup of sugar and 4 tablespoons of cold butter or margarine (I use Earth Balance). Rub the butter into the flour sugar mixture with your fingers until course crumbs form. Spread the topping on the fruit mixture. Bake about 40 minutes at 350°F until the crumb topping is golden but with a few spots of light brown. We ate our raspberries straight from the box. They’re too delicious to eat any other way. I think that covers everything. This is Greg and my second year with the Southside CSA, and we really love it. We’re enthusiastic cooks, and enjoy the challenge of figuring out what to do with our veggies each week.